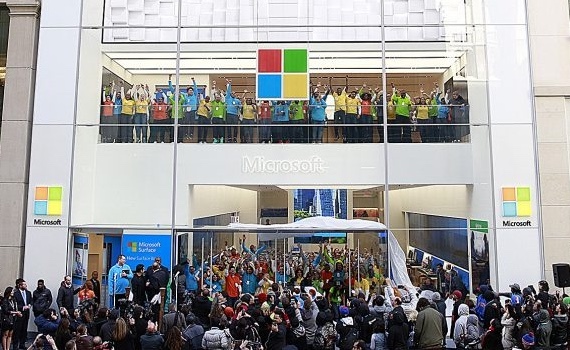 Microsoft has announced place to open a flagship store in London on Regent Street at Oxford Circus, near the existing flagship Apple store. So no pressure, no competition then...! Last time I was there (on that exact spot) was when the ill-fated Nokia store was closing down, years ago. (Dark, unwelcoming, if you recall.) I'm sure Microsoft's store will fare better! Today, we are pleased to announce plans to open a flagship store in London on Regent Street at Oxford Circus. This is one of the world’s most exciting shopping destinations and represents another step in our journey to meet our customers. The United Kingdom is home to some of our most passionate fans. We already enjoy connecting through our partners and in our digital stores, and look forward to bringing a physical store to the region as another great choice for customers to experience the best technology from Microsoft. Microsoft Store is a place to have fun! Our stores are hubs for local gaming communities, where fans gather to play their favorite games like “FIFA” or “Forza” during events or in one of the competitive tournaments in our Mixer NYC Studio. We are excited to extend similar experiences to our customers in London. Our store stands for the best of Microsoft. We are excited to showcase gaming, mixed reality, AI (artificial intelligence), and all technology that empowers people to achieve more. Look for more details in the future! While I'm quite excited by the news, note that we don't have a date yet, so we could be talking well into 2018. Plus - and sorry for being snarky - 'a place to have fun' and 'a real hub for the community' sound exactly like some of the rhetoric coming from the Apple keynote stage recently. I know we all go into these stores to browse, fondle and occasionally check our email or look something up (safely), but 'fun' and 'community' are stretching way too far. Especially as this is Microsoft we're talking about. Not even Apple can pull its rhetoric off!